In the absence of an FY2016 budget, the group health insurance program is one of the major areas of State government for which there appears to be no legal authority to pay the bills. Nevertheless, the program’s costs must be paid eventually because of State law and union contracts. When the overdue bills are finally paid, the State will owe substantial late payment penalties to managed care companies and health care providers. Even without a budget in place for the year that began on July 1, 2015, Illinois is authorized to make numerous payments due to State law and court orders. In addition, although Governor Bruce Rauner and the Illinois General Assembly have not reached agreement on most of the FY2016 general operating budget, the Governor did sign an appropriation bill for elementary and secondary education. Overall, an estimated 90% of expected annual expenses may be paid despite the lack of a budget. Besides group health insurance, the main areas for which payments are not authorized are higher education and human services programs that are not covered by Medicaid. The backlog of unpaid claims held by the State Employees Group Insurance Program totaled $2.05 billion as of the end of October 2015, according to the Governor’s Office of Management and Budget, up from $1.40 billion in October 2014. In a recent report, the legislature’s Commission on Government Forecasting and Accountability noted that the largest portion of claims in October 2015 were from managed care companies, which could expect to wait about a year to be paid. Although the current budget situation is unusual, claims backlogs and payment delays are nothing new for the group health insurance program. As explained on the website of the Department of Central Management Services (CMS), the program has often been underfunded in recent years, regularly resulting in payment delays of eight months or longer. CMS manages the group health insurance program, which covers approximately 363,162 employees, retirees and dependents. Unlike most other State bills, group health insurance claims may be paid from future years’ appropriations under an exception to Section 25 of the State Finance Act. The State used the provision to mask budget deficits in the past by appropriating an insufficient amount to cover group health insurance costs in one year, knowing that remaining bills could be paid from the next year’s budget. The deferred bills are known as Section 25 liabilities. The Governor’s recommended FY2016 budget, issued in February 2015, proposed $1.195 billion in General Funds appropriations for the group insurance program, compared with projected costs of $1.850 billion. (The General Assembly passed legislation with the appropriation amount recommended by the Governor, but it was vetoed.) Savings were expected to come from new union contracts to replace labor agreements that expired on June 30, 2015, but those negotiations are ongoing. The State is required to pay interest penalties on overdue health insurance bills under two statutes. Under the State Prompt Payment Act, which applies to managed care companies, interest accrues at 1% a month on complete claims that are not paid within 90 days. 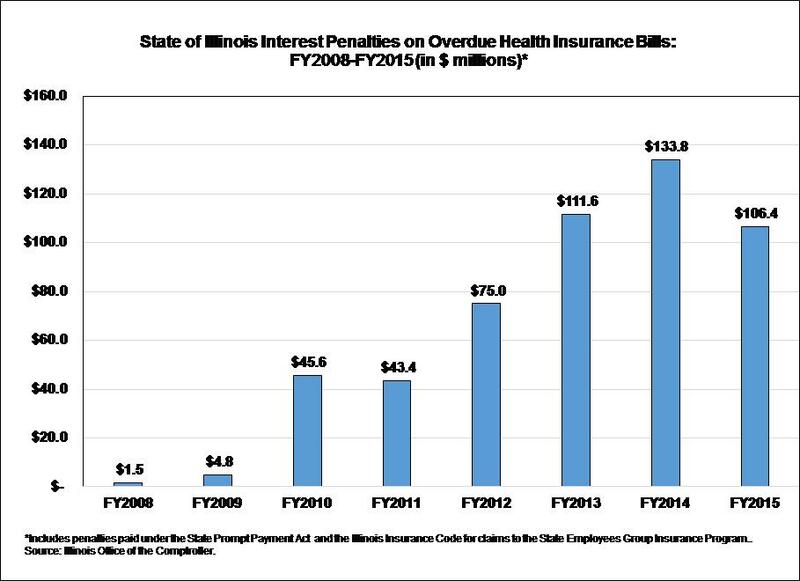 Claims from health care providers accrue interest at 9% a year after 30 days under the Illinois Insurance Code. The following chart shows interest penalties related to the State group health insurance program from FY2008 through FY2015. The State has paid $522.1 million in such penalties during that period, according to data from the Illinois Comptroller’s Office. Interest penalties are not paid until the State pays the underlying bills, which means that the amount of interest penalties paid in FY2016 will depend on the timing of bill payments. Interest penalties spiked in FY2014 because of a supplemental appropriation that permitted the State to pay off bills. Late payment of health insurance bills has recently accounted for most of the interest penalties paid by the State. In FY2015, the State paid a total of $126.1 million in interest penalties, according to the Comptroller’s records. Of that amount, $106.4 million, or 84.4%, was related to the group health insurance program. During the budget impasse, insurance premiums are being deducted from State employees’ paychecks and health insurance coverage is continuing. CMS notified participants in late September 2015 that managed care companies had agreed to pay health care providers on their normal schedule, even though payments to the health maintenance organizations themselves were delayed. For self-insured plans, in which the State pays the direct cost of each claim, payment delays to health care providers were expected to increase until a budget is passed. CMS advised participants to contact the agency if doctors or hospitals requested to be paid up front for service. The State’s largest union, Council 31 of the American Federation of State, County and Municipal Employees (AFSCME), has asked a St. Clair County judge to require the State to make payments on behalf of participants in the group insurance program. The court has not yet taken action on the request. On November 25, 2015, the same court issued a temporary restraining order requiring the State to make contributions to a health fund for State homecare workers represented by SEIU Healthcare Illinois. In that instance, the labor agreement called for a monthly State contribution to a separate health insurance plan administered by the union.